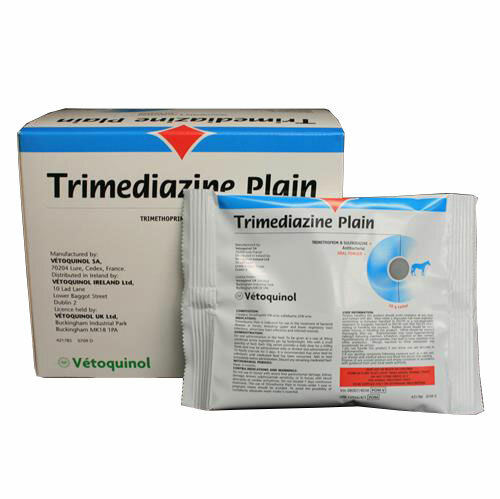 Trimediazine Oral Powder can be given mixed in with a small feed & contains a broad spectrum antibiotic. 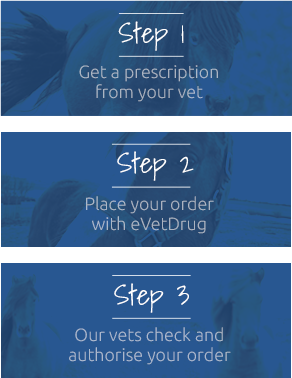 It can be used to treat bacterial infections in horses, including those caused by Staphylococcus spp; Streptococcus spp; Escherichia coli & Rhodococcus (Corynebacterium) equi. One packet is a daily dose for a 500kg horse. Warnings & Contraindications- Not recommended to be given to horses with known hypersensitivity; blood dyscrasias or severe hepatic (liver) or kidney dysfunction. Do not exceed 7 days continuous administration. Avoid giving to horses less than 1 year old. Persons handling this product should wear gloves & avoid inhalation of any powder. Wear either a disposable half-mask respirator conforming to European Standard to EN149 or a non-disposable respirator to European Standard to EN140 with filter EN143 when mixing or handling this product. Wash hands thoroughly after use.